Google released Android Studio version 2.3 in March and 2.4 Canary version in April, still in May 2017, in I/O developer conference, Google announced the latest version of its Integrated Development Environment (IDE), Android Studio 3.0 with unleashing the coming of new Android 8.0 namely -Android O. Making announcement surprising still significant for developers, Google renumbered the release as plenty of interesting functionalities and advancement in new release. Have a glance on the features added on in Angular Studio 3.0 (Real reason for a new version). 1. Upgradation of Core IDE – Core IDE is updated to IntelliJ 2017.1.2 from IntelliJ 2016.3, which adds up a range of performance boosting features like semantic highlighting, new many lint checks, refactoring and embodiment of parameter hints, quick search results and much more.Also, Instant Run debug issue 234401 is resolved. App simply hot swap when a method implementation is changed. It should not restart if there are no pauses at breakpoints, unlike older version. 2. New Android Profiler – Android Monitor window is replaced with interestingly designed Android Profiler. It has separate timelines to view realtime, unified view for Android app’s activity – CPU Profiler, Network Profiler and Memory Profiler. Each of them highlights detailed information like touch events, key presses and activity changes. To access it, click on View → Tool Windows → Android Profiler and by clicking on concerned app process each performance aspect is visible in depth. Now, in Android Studio version 3.0 ‘logcat’ has a separate window. 4. Effective Layout Editor – Android Studio Layer Editors are now with powerful functionalities and enhancements. Updated component tree with improved drag-and-drop view insertions, new Error panel and Chain creation process has been enhanced. Moreover, Android Studio 3.0 provides additional support for view Barriers and Groups. 5. Proxy Support – To manage proxy settings, a user interface is included. From now, Android Emulator will use these settings by default. Indisputably, settings can be overridden for network setup from Extended Controls → Settings → Proxy. 6. Java 8 Features Compatibility – Android Studio 3.0 incorporates built-in support for Java 8 libraries and selective features of Java 8 language toolchain. Simply disable Jack and change to Target and Source compatibility to 1.8. Version 3.0 even added extensive support to new Java 8 feature – Instant Run. 7. Instant Apps – Disclosure of Instant Apps brought instantaneous eagerness amongst developers and users worldwide. Instant apps are to let the user have a glimpse of the android application without installing it. Suppose while surfing information on a phone browser, a user will get the link of the instant app. Instant apps are highly beneficial for marketing perspective and to reach targeted audience promptly.From user end, instant apps load as faster as a web page and no need to download a fully-featured android app to check out whether it is valuable or not. Glance (Instant App) fulfils the purpose. To create Instant Apps, developer has new module types – Instant app and Featured with a new Modularize refactoring action and the App Links Assistant. Even another option is to Right click on a class and navigate to Refactor → Modularize. Push Notifications was for Quick interaction and Instant Apps are for quick view to app without downloaded, isn’t it super interesting? 1. Enhanced APK Debugger – All-new Debugging functionalities let coder debug APKs without building them from an Android Studio project making over-all debugging process more high-fidelity. Simply select Profile or debug APK from the Android Studio Welcome Screen or File → Profile or debug APK. The developer can also analyze and do profiling with this feature. 2. Android Things Support – Internet of Things (IoT) is very buzzing in market nowaday. Looking to a rage of IoT, Google provided highly customized features for Android Application Development on IoT platform in Android Studio version 3.0. This update is named as Android Things, which possess an array of new templates to seamlessly create apps with New Module Wizard’ and ‘New Project Wizard’. 3. Android Wear Rotary Controls – Rotary controls are used to test Android Wear 2.0 apps. Rotary controls are for emulator system image. 4. 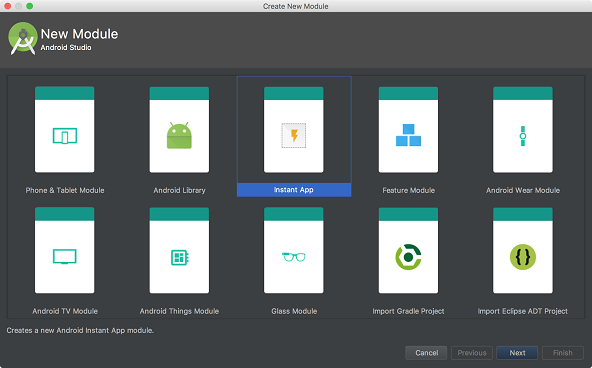 Rapid Build Times – Android Gradle plugin truly achieved the official theme of Android studio update – ‘Speeds and Smarts’. Depending on the app development process, build time may vary from seconds to minutes, but Gradle plugin has surely boost build speeds. A faster IDE. 5. Google’s Maven Repository – With version 3.0, maven dependencies are distributed individually in Maven Repository (Outside Android SDK Manager) leading to simpler management of Continuous Integration builds. 7. Google Play system images – Google Play Store is included in Android Emulator O system images so apps can be tested completely. Android Emulator keeps Google Play services up-to-date in Android Virtual Devices, updates can be triggered similarly as on physical devices. 8. XML Fonts – Add custom fonts to Android O app development easily with XML fonts preview and font selection tools. To avoid font resource bundling in APK, downloadable font resource can also be created. 9. App Bug Reporter – Click on Emulator Tool Bar → Extended Controls → Help → Emulator Help → File a Bug to easily generate a bug report with all essential configuration settings. 10. Layout Inspector – To debug issues with app layouts, combine grouping properties into common categories and new search functionality in both the View Tree and the Properties panels got easier with advancements in Layout Inspector. Open Layout Inspector by clicking on Tools → Android → Layout Inspector. 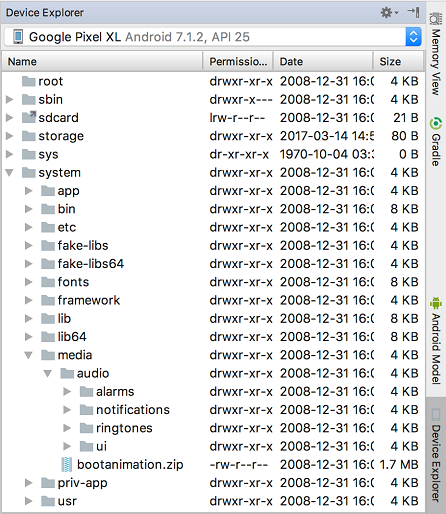 New Device File Explorer let the developer view file and directory structure of Android device or emulator in Android Studio itself. Also, the developer can modify app data files directly in Android Studio while testing an app.It merely replaced the device filesystem intercommunication previously achieved via DDMS. 12. Adaptive Icon Wizard – Android O presents adaptive launcher icons, which can be seen in various shapes on different Android devices. To create a new asset, right click on the /res folder in the project and further click on New → Image Asset → Launcher Icons (Adaptive and Legacy).New and legacy launcher icon assets are created by the wizard, which displays previews of an adaptive icon on various launcher screen icon masks. 13. Revision in APK Analyzer – With APK Analyzer, developers can produce Proguard configuration rules and load Proguard mapping files in the DEX viewer and can also observe DEX bytecode of classes and methods. APK size can be further optimized by analyzing Instant App zip files and AARs. It also caters new filtering options at the top to show and hide fields and methods. 14. Support for Android 8.0 App Development – Doubtless, Android Studio 3.0 supports Android O application development. Android Studio 3.0 is highly user-friendly in compare to earlier versions. Android Studio is finally released. Each release of beta version and canary versions fixes up bugs and other minor issues to meet Android developers’ expectations at final Android Studio 3.0 launch. It is indeed worth waiting for the new update in the world of Android app development.